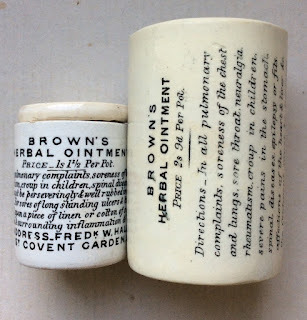 This page shows the various types of 'Brown's' pots originating from the central London area. 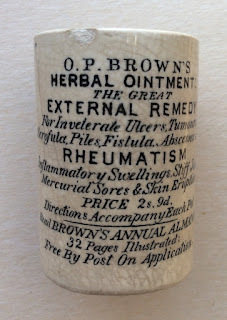 Dr Oliver Phelps Brown was born in the United States in 1825 and lived 53 years. 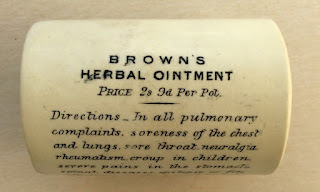 He developed a great interest in herbal medicine and by 1850 had established a propriety medicine business in New Jersey, USA. 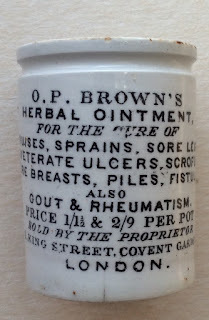 During the mid 1890's, it is recorded that Dr. Brown travelled to London to establish a business outlet at the address of King Street, Covent Garden; the address that appears on many of his pots. He established a partnership with Frederick W Hale, another American citizen who was born in 1848. 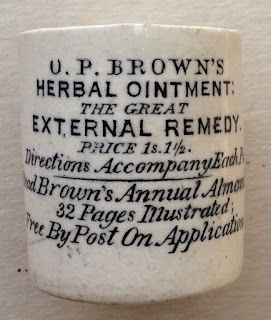 In 1880 the trademark for Brown's Herbal Remedies was registered in the UK. 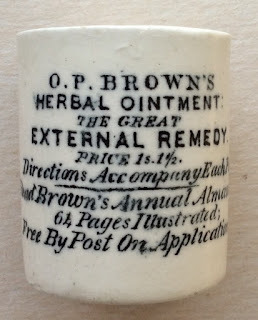 Business flourished for the Brown's products and later, the "Natures Herbal Ointment" brand was introduced. 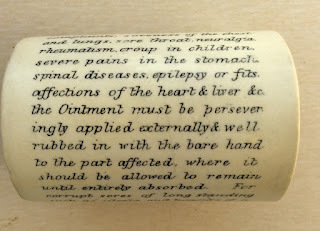 These pots, which came in two sizes, carry many lines of writing detailing the remedies and instructions for use. 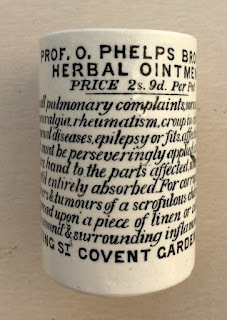 In 1883 the business moved from King Street to Chandros Street, (still within Covent Garden) where the business continued to trade until 1902. 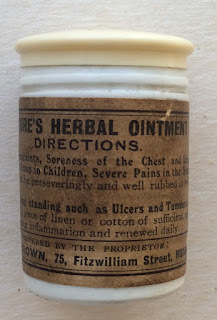 There was a further address change from 61 Chandos Street to 60 Chandos Street. 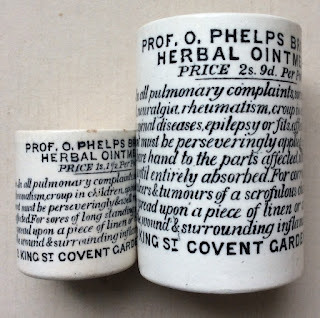 The address change is evidenced on the smaller sized pots. 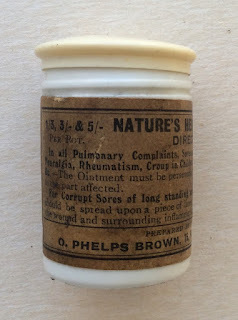 In 1906 the business of 'Brown O Phelps Ltd' was established. 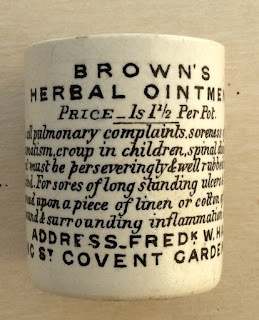 The chronological order of the "Brown's" pots therefor are (1) Brown's Herbal Ointment (2) O.P. 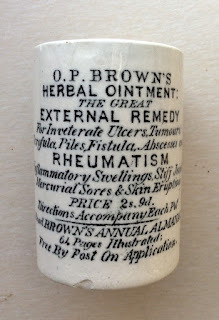 Brown's Herbal Ointment, (3) Natures Herbal Ointment and (4) Prof. O. Phelps Brown's Herbal Ointment. 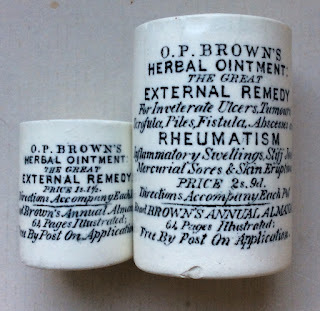 Several variations of these pots are rarely seen. 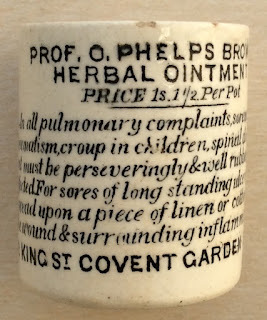 book produced by Messrs. Houghton & Priestley, pages 48 to 56.